These Fireproof Filing Cabinets have been engineered to withstand temperatures in excess of 1050°C for 90 minutes (Paper) Digital Media (60 Minutes). 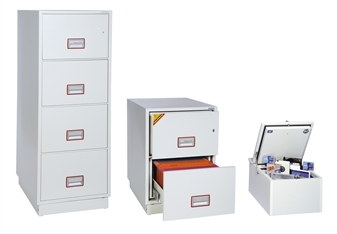 Ideal secure storage for any school, college, university, or any business office where sensitive documentation needs to be protected. 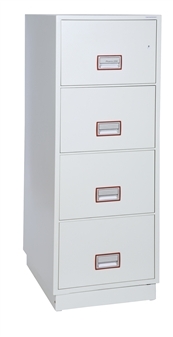 Available in standard two or four drawer versions, each cabinet features automatic locking with a single security lock acting on all drawers. Each drawer may be isolated to provide a combination of locked and unlocked drawers at any one time. Available with key locks or a high security electronic lock. Also available is a 'Data Protection Insert'. 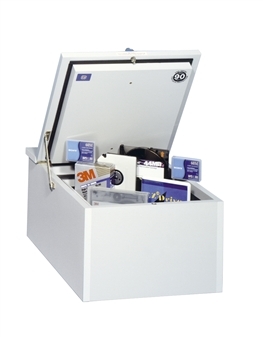 Data media such as computer disks and tapes require added protection from heat and moisture, extending the firefiles capability to cater for this requirement is the media chest. 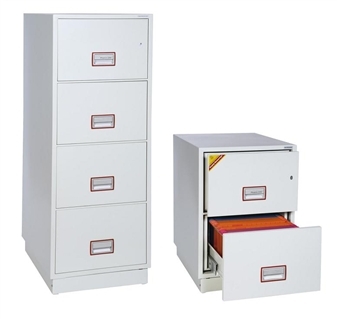 This unique data protection unit, fitting snugly into the bottom drawer, provides for ease of use and ensures maximum protection for your valuable data. 1. Insulation is provided by the unique light weight Styronite F insulation material. 2. All steel is electrolytic zinc coated to provide for an extended life. 3. Applied on top of the quality urethane epoxy primer is a durable urethane hammertone paint. This combination provides for a brighter, smoother and longer lasting finish that resists scratching or marking. 4. Hanging rails are adjustable to accommodate fools cap, A4 and A5 files. 5. Heavy duty slide rails allow the drawer to move back and forth smoothly while carrying up to a massive 50kg of filing. 6. Locking can be by the standard high security key lock, or user friendly electronic lock. 7. Recessed handle is neat, easy to use and fitted with index card. 8. Each drawer is individually insulated for better fire protection. 9. Tight construction of body and drawer prevent smoke and heat damage to the contents. 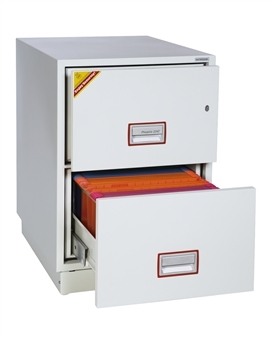 Fireproof Filing Cabinets offering 90 minutes fire resistance at temperature of 1050°C. NT Fire 017-90 Paper test. A high security keylock or electronic lock operates independently on each drawer. Optional Data Protection Insert available to protect computer media.